Here is an IR image of moisture on the underside of a roof not visible with the naked eye. 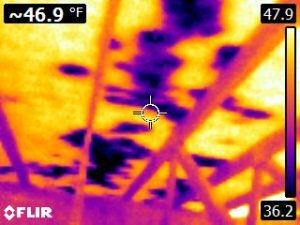 Here is an example of an IR image of moisture found in the attic, on the underside of the roof, using the infrared camera. No sign of moisture was visible with the naked eye. 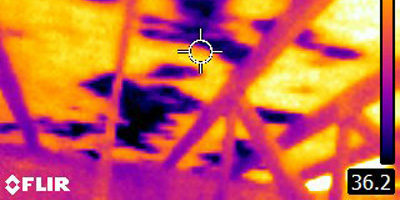 However, using the infrared camera we can clearly see the pervasive moisture on the roof’s decking. Best Choice Home Inspections will inspect your home with infrared at no additional charge. This is just part of our service, providing you with the best possible inspection using the latest technology.